The Theology Department at Carroll College teaches Christian theology in the Roman Catholic tradition. We explore the nature of the Christian faith, its biblical and intellectual heritage, and how this heritage has informed and continues to inform Christian belief and practice. The goal of our inquiry is three-fold: (1) to help you understand the particularity of Catholicism in relation to the broader Christian tradition, (2) to consider important questions about the role of the Christian faith in contemporary culture, and (3) to provide you with a solid knowledge of and appreciation for different faith perspectives. Students will understand the basic principles and concepts in biblical, moral, and doctrinal theology from a Catholic perspective. 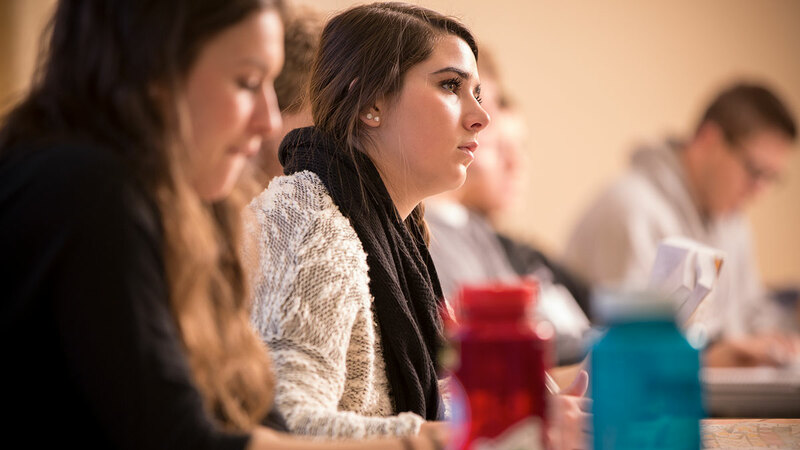 Students will engage a variety of theological perspectives and be able to interpret and evaluate them. Students will investigate and articulate the relationship between theology and other fields of studies. Students will develop critical thinking for reading, thinking & writing. Students will develop an understanding of the fundamentals in theology that will prepare them for graduate studies and/or church work. Worried you can't get a job with Theology? Hold your horses! Our emphasis on doubling a major in theology with a major in another discipline sets our students up for success in a wide range of endeavors. Our theology graduates have pursued careers in the medical sciences, politics, and education. They have also pursued graduate work in both theology and other fields at such prestigious institutions as the Harvard Divinity School, Union Theological Seminary, Fordham University, University of Notre Dame, Weston Jesuit School of Theology, Iliff School of Theology, and the Gregorian University in Rome. Why does theology allow for such a diverse set of options? Instead of studying how we live, theology studies why we live. So, what we're saying is this: come study Theology with us and get a job and become a better person, thinker, and believer in the process. That's what we want, too! “Explore the Deep” (duc in altum) is our restatement of Pope John Paul II's call to "go out into the deep" and illuminate the gospel. Any such outward illumination depends on a movement inward and an illumination of the same to ourselves: that we know and understand what we believe.